Which is why I am recommending a new book that provides a stunning pictorial look at our wonderful river along with some of its tributaries – both natural and man-made. London’s Waterways: Exploring the Capital’s Rivers and Canals is an absolute gem that pokes about in the backwaters and eddies which make the river such a fascinating subject. The book, written and photographed by Derek Pratt, who has been building up a library of fascinating anecdotes and superb photographs of London’s waterways for more than 45 years, offers a unique insight into the Thames as it winds its way from Hampton Court all he way down to London’s Docklands. Mr Pratt blends together a mixture of classically beautiful pictures of the river along with some of the notable sights and places of interest that dot the banks on its way through the capital. They include Hampton Court itself, the King’s Stone at Kingston, the shining power and pomp of the Kew Steam Museum and the untouched natural beauty of the Barnes Wetland Centre. But he reserves some of his most dramatic photography for the journey through central London itself. Whether it be a great shot of the chimney’s of Sir Giles Gilbert Scott’s majestic 1937 Battersea power station silhouetted by the setting sun or an amazing picture of a major black storm cloud approaching Vauxhall Bridge which is still bathed in late afternoon sunshine, every chapter has something to grab you. Pratt’s tour also takes in London’s canals – the Grand Union and the Regent’s Canal – along with many of the major tributaries including the River Lee, the Wandle, the Crane and the Fleet. 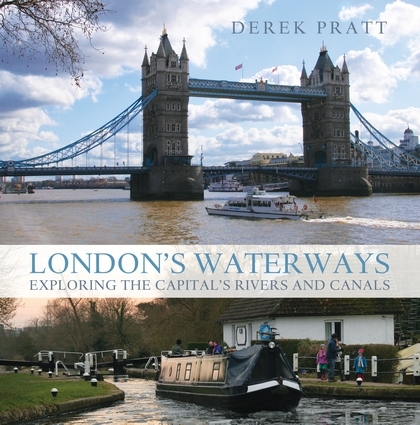 London’s Waterways is published by Adland Coles Nautical on March 1, priced at £19.99. (ISBN 978 1 408 11074 4). It’s a great book for anyone interested in the river and its moods.